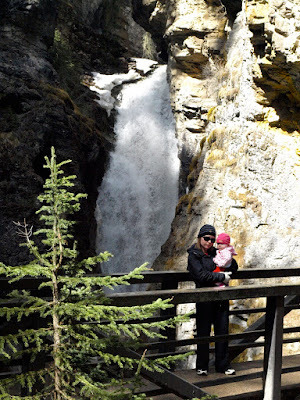 I forgot that last week I said I would post something about a National Park every Tuesday until early yesterday morning so I quickly found some photos from various hikes through Johnston Canyon. 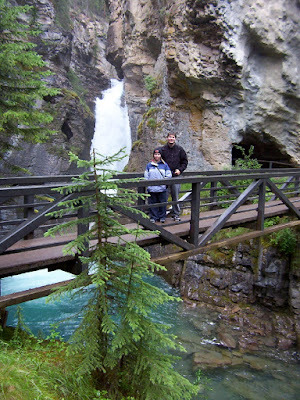 This is one of thee most popular hikes in the area and so we try to avoid it during peak visitor times in Banff. 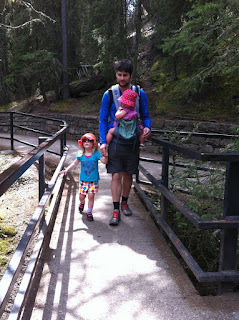 This is a photo from our very first visit to Johnston Canyon. Or at least mine, I think Greg had visited as a child, I can't remember and he's not home yet to confirm. It was August 2004 - 1 month before Greg moved to Calgary and 2 months before I did. The first time we hiked it, it had rained earlier and someone had fallen and broke their arm. There was no cell service there then like there is now. 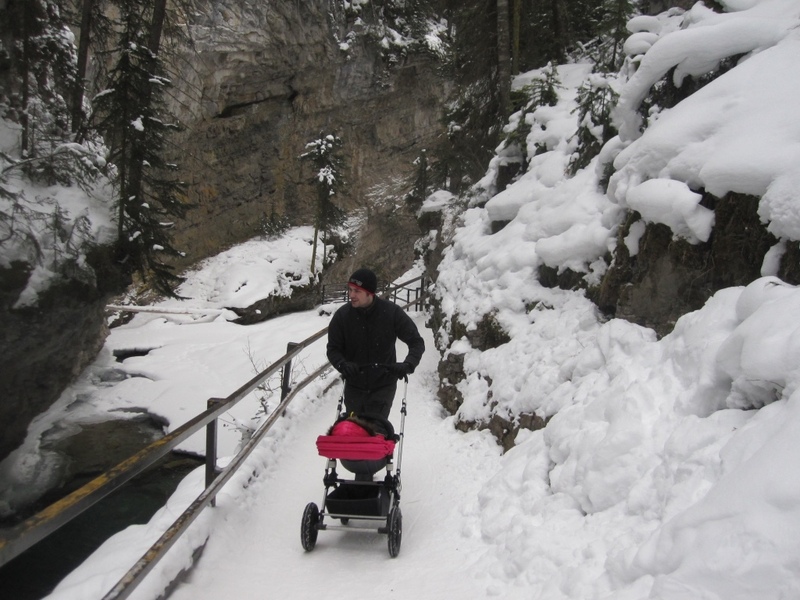 This was Finley's first trip up Johnston Canyon in the winter. The creek which is the body of water you see when hiking the canyon is called Johnston Creek and is a tributary of the Bow River. A family hike up I am guessing in the summer which is weird. Judging from Penelope's size I am thinking it was her second trip up the canyon. Johnston Canyon also has a campground close by called Johnston Canyon. It is reservable and it fills up fast but it is really nice and the sites are fantastic and quite big. There are lots of trees and lots of kids for them to play with. We have only stayed here once but it was definitely one of our favourites. 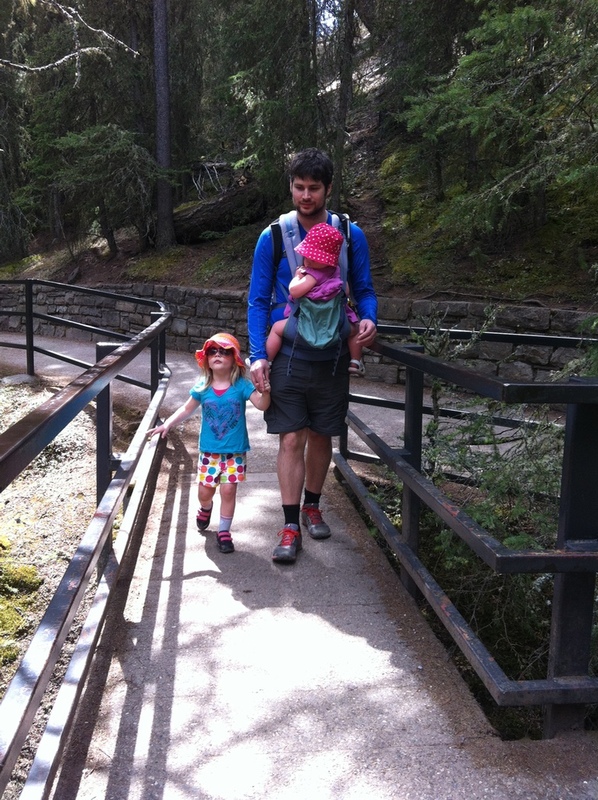 Another campground close by is Castle Mountain which is not reservable and probably half the size of the Johnston Canyon campground but it is probably one of our favourite places to stay as long as you can get a spot. Both campgrounds have real bathrooms and running water. 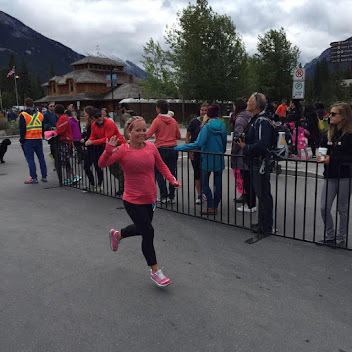 This was Mother's Day in 2015. 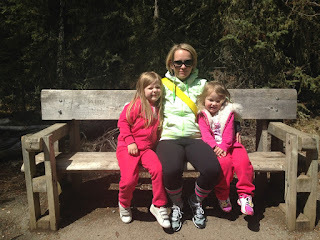 5 of the last 8 Mother's Day have been spent hiking Johnston Canyon and usually Tunnel Mountain too. We have lived here in Calgary for almost 13 years and we have hiked Johnston Canyon at least 13x. Some years we have hiked it more then once. It is truly a beautiful hike no matter what time of the year you do it. It's really just how much you like dealing with crowds and trying to find a parking spot because it fills up quickly and early during the summer months.